To witness the painful emotions of inconsolable parents, grandparents, and great grandparents was difficult to watch. Three children — ages three, six, and ten — were gone, seemingly in the blink of an eye, like steam dissipating from a hot shower gone cold. It’s like black magic. First, they’re here; then they’re not. Past joyful memories cannot erase the three white caskets that are spread out in the pulpit before us. No one can comprehend the senselessness of how something so seemingly innocuous could possibly cause such devastation in the lives of everyone left to pick up the pieces. The children had not been murdered. If they had, at least the monster who committed this horrible crime could be blamed and sentenced to death or serve life in prison without parole. It wasn’t a murder-suicide and thank the gods for that small reprieve. However, if that had been the case, maybe finding a quickly scribbled note explaining some plausible reason may have provided some solace to those who wondered why. There was no drunk driver that one could accuse for running a red light and slamming into the vehicle in which they were so securely strapped. There wasn’t a house fire where possibly candles were left burning too close to the drapes, or a kerosene heater had accidentally tipped over, or one of the children was playing with matches. Nope, the deaths weren’t even caused by a hereditary disease. If this had been the case, maybe knowing could have filled the void or placated the anguish, sorrow, and anger their deaths were causing. Everything that needed to be done to protect their children had been done, or so everyone thought. It was too late now but the list of safety issues kept replaying in the parents’ thoughts. Working smoke detectors were installed throughout the home. Everyone buckled up or were in their car seats before the stick shift moved from “park” to “drive.” Verbal warnings had been preached religiously about talking to or going off with strangers. There were many rules about safety that everyone had to abide by — no exceptions. But unfortunately, there were no rules against smoking cigarettes inside the home or in the family vehicle. There was no rule prohibiting anyone else from smoking around their children. No one, not one single relative, friend, coworker, or health professional talked to the parents about the dangers of second-hand smoke. Or if they did, the parents chose to ignore the warnings as frivolous mumblings. So, every day, seven days a week, these three young children’s lungs that were meant to inhale and exhale for at least another 70 or 80 years, were subjected to an environment where imminent childhood death could have been prevented. Apparently, the children’s ongoing asthma attacks, ear and respiratory infections, and/or coughing and wheezing weren’t enough viable clues for their parents. Now sadly, those clues are memorialized in three small caskets. And, even though the cause of death was second-hand smoke, it is still directly related to the parents’ ignorance or carelessness. In the final analysis, they have to live with this guilt and find a way to forgive themselves. NOTE: This story is fiction; however, it could easily be nonfiction if children are continuously subjected to an environment of second-hand smoke on a daily basis. Children are our future and must be provided with a healthy start and a healthy lifestyle. 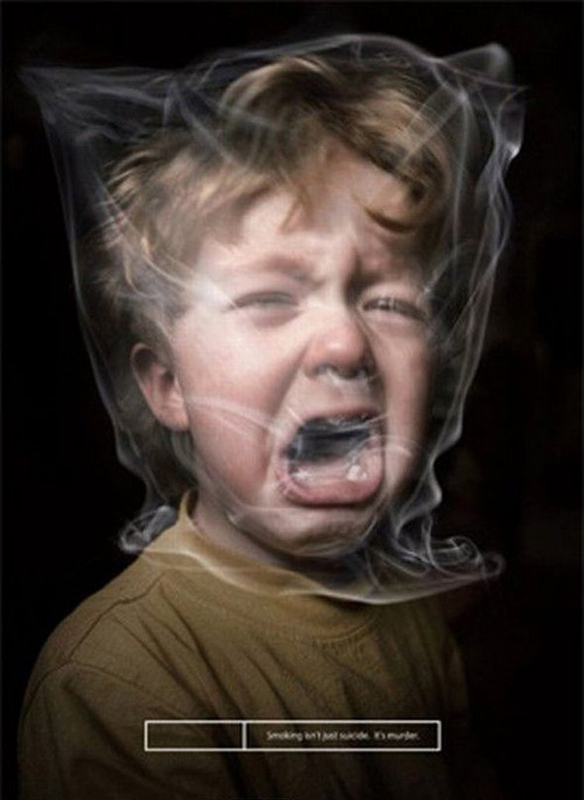 Second-hand smoke must be eliminated from their environment. This is a preventable death. It all comes down to making a decision. Parents can make an intelligent choice whether they want to kill themselves or not by smoking. But, children don’t have the luxury of choice. Let’s give our children their God-given right to enjoy a smoke-free environment before this fictional story today becomes a reality tomorrow. Powerful piece, Miss Gwen. And disturbing photo. You make excellent points. OMG! I was that kid who couldn’t take 2nd hand smoke. I was always coughing. My mother smoked, father smoked, grandmother smoked, and grandfather smoked. It is suffocating to a child! No amount of waving the smoke, as if that made it vanish from the air, could get me to stop coughing or eyes cease from burning. Aside from my personal testimony, this story line is the beginnings of a good fictional short story or novel.